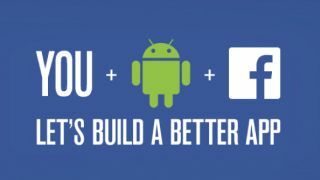 On Thursday, Facebook took the next step in audience engagement by opening a new public beta for its main Android app. Anyone can be a beta tester, as long as you have Android, the Facebook app, and have signed up for the requisite Google and Facebook groups for feedback. Facebook claimed the wide variety of different Android versions provide a challenge when testing the quality of its app, and the social network believes with the aid of its users around the globe, tracking bugs and issues on all those Android devices will be much easier. This, in theory, should result in better and more reliable performance from the vastly popular app on any and all Android smartphones and tablets. Getting in on the action requires a bit of work, as you'll first have to sign-up for an official Facebook for Android Testers Google Group. A new "Become a Tester" option on the Facebook app page on the Google Play store lets you do just that, followed by a download of the app in beta form. However, the beta version is still supposed to be used as you would regularly, though Facebook admits that along with improvements and new features, the app will be slightly more unstable than the standard one. Feedback can then be given through the Facebook for Android Beta Testers group on Facebook itself, which is a wholly different group than the Facebook for Android Testers on Google. According to The Verge, Mike Shaver, director of engineering at Facebook, said this latest venture is part of an effort to make the mobile version much more like the website, in that the network wants to roll out its changes slowly to a few users before pushing the final update through. Facebook had already been testing early versions of the app with mobile manufacturers like Qualcomm, HTC, Ericsson, Sony, Huawei and MediaTek, but hopes this next step will help coalesce the Android ecosystem. For now, the beta program will be strictly limited to the main Facebook app, with the company focusing on creating the best app possible regardless of whether the consumer is using Gingerbread or Jelly Bean, or has certain hardware limitations. That said, there's a chance the beta could extend to other Facebook Android services too, such as Facebook Home and Chat Heads. Facebook may also be interested in introducing new features for testing to see what users think before pushing them out officially to a wider audience. "We are in the early days of Google's beta program, but we're excited to work on extending our testing coverage at scale and providing the best app experience to everyone using Facebook," said Product Manager Ragavan Srinivasan on the company's blog. Facebook and Samsung may be big on Android, but that doesn't mean the two companies are collaborating on a new phone.